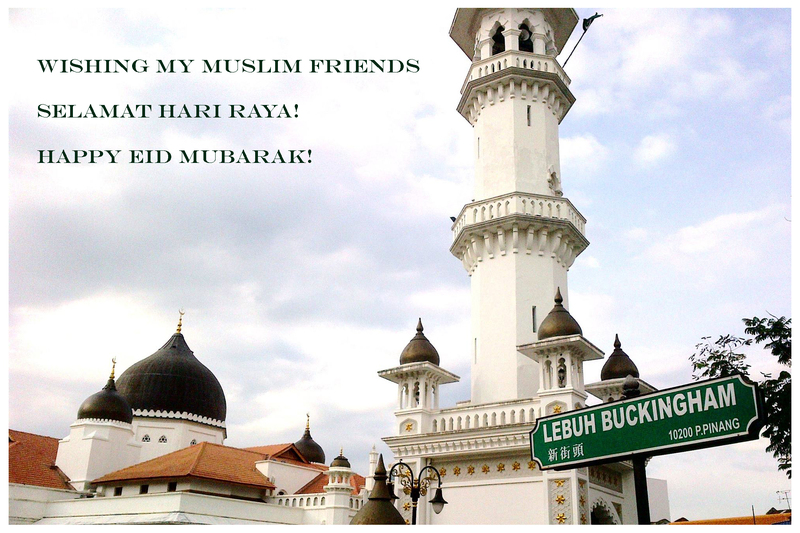 Wishing my muslim friends and family Selamat Hari Raya and Happy Eid Mubarak! Today marks the end of Ramadan, the month long fasting from sunrise to sunset. Muslims greet each other with the words “maaf zahir dan batin”, which means “Forgive my physical and emotional (wrongdoings), it is also a celebration of unity. The Eid prayer is to ask for God’s forgiveness, mercy, peace and blessings for all living beings across the world. In Malaysia, this is a 2 day public holiday but the celebration lasts all month. It is customary to have open houses where friends, families and neighbours are invited to celebrate over food, and this includes non Muslims in a show of unity. Well, I’m off today to my friend’s open house to celebrate this day with her friends and family. I live in a country where my friends are of different religions. It is not them who are tainting the religion. How kind of you to offer this, at a time when Muslims are so vilified by so many. Cheers. I think people have become misguided, not Islam nor any other religion at it’s purest form. Looking what is happening in Syria and Iraq in the name of the Islam I can only say if I was an Islam follower which I am not, I would hang my name in shame because the Islam has become an evil religion. Please accept me as a spiritual pagan and not an enemy. and to you, as well; our spiritualities … share … similarities. the month long fast last from sunrise to sunset everyday depending on the country you are in. So during daylight hours, one cannot consume neither food nor water. When the sunsets, you can break fast and eat modestly and perform prayers. fasting is to develop and strengthen powers of self-control for the purpose of self improvement. To be nearer to God by following the spiritual cleansing. To remember those who are suffering. Fasting includes refraining from causing harmful acts, bad habits and to do good, give to charity. Oh ok … I wanted to ask what’s the purpose of the month long fasting and what can be eaten during that time .. I never really understood the deeper meaning of it..
Are you a Muslim ?? ?